Are you an avid bicycle rider? Do you like taking your pooch along for a ride? If the answer is affirmative, you’ll be pleased to know that you don’t have to use a dog bike leash or a bike trailer to do that. Have you heard about the dog bike basket? These things have become quite popular in the last few years, and for a few good reasons. First of all, the dog baskets for bicycle very affordable and are an excellent budget-friendly option for those looking for a cheap solution. Typically, they are also well-padded, machine-washable, and come with restraint systems to provide your pet with safe riding experience. But the primary problem here is the fact that there are dozens of different brands and models in today’s market. Those who don’t know a lot about these products will have a tough time with selecting one that’s worth their time and money. But, have no worries – that’s why we’re here! We’ll be taking a closer look at the most popular dog bike baskets and find out which of them deserve to be considered for purchase. We’ll go over their features, advantages, as well as flaws – join us, and we’ll help you find a model that suits your (and your pets) needs the best! The first basket we’ll be taking a look at is the Tagalong Wicker, which is capable of creating a secure, luxurious, and mobile environment for your small dog. It comes with a very convenient bracket system, 3-way adjustments, and is also the most affordable product of this type on our list. Measuring 16.5″ x 10″ x 13″ in dimensions and weighing 6 pounds, this product is capable of fitting dogs that are up to 13 pounds in weight. Even though the manufacturer claims that the model comes with the authentic rattan design and a full sheepskin liner, the whole thing is made out of synthetic materials. That’s not a bad thing – it still looks and feels very comfortable. This old-fashioned look is undoubtedly the main selling-point here – many will be drawn to this product because of its authentic aesthetics. But the more important thing here is the fact that the previously mentioned bracket system is quite beefy and feels very safe once you assemble it. Once you get the hang of it, you will be able to pop the hamper on and off without much issue. The package also includes two adjustable straps that provide additional stability if needed – you just have to connect the loops on the product with the handlebars on your bike. As far as we’re concerned, these straps should be attached every time you intend to use the pet basket for a bike, as they indeed make the whole riding experience a lot more secure and bring the necessary peace of mind. The Tagalong Wicker comes with a removable safety lead that’s attached to the bottom back of the model. It’s quite sturdy and very adjustable, allowing you to simply click your dog’s harness into it. We highly recommend this affordable basket to the owners of smaller dogs. Once you attach the pet’s harness to the dedicated safety lead, your pup will be able to comfortably stand, sit, and turn while still being limited to the inside of the hamper. We like it! Next up is Pet Pilot, a quality dog bike carrier that offers a ton of useful features for a reasonable price. It’s a customizable, well-designed and a safe, that’s held in high regard by some pet owners all over the world. Let’s check out why! The thing that separates this model from the competing products is the choice of colors – the potential buyers can order it in one of five different color combinations. We had the green & black version on a review, and have no complaints about its overall look and design. Even though it’s made out of mesh material, the model features an extremely durable steel frame, as well as the robust mounting system that’s guaranteed to keep the pet safe and sound. The mesh material that we mentioned acts as the cooling air vent, which makes this hamper ideal for the long summer rides. The pup won’t experience overheating while in it, and that’s always a big plus in our book. This product also features a patented handlebar locking design for some extra stability. During our testing, we noticed that the model is very stable and secure, and can comfortably hold dogs that are up to 20 pounds in weight. The handlebar bracket allows easy installation and removal, taking away the hassle and making the whole process as easy and quick as possible. Of course, there’s a leash attachment inside the hamper, so you won’t have to worry about your pup jumping out in the middle of the ride. We also liked the presence of the reflective siding that keeps both the owner and his dog visible at dusk, as well as of the pockets that allow storage of things like bottles, phones, keys, treats, and leashes. As far as we’re concerned, this model is well worth the price that it comes at. With a sturdy frame, breathable material, a patented handlebar locking design, and availability in five different colors, the Pet Pilot certainly deserves our sincere recommendation. For larger dogs, the Pet Rider made by Snoozer comes with a plywood-reinforced base that’s combined with foam padding and can be mounted on the back of your bicycle. Its many safety features make it one of the most popular products of this type on the market – let’s check it out! The exterior of this model is made out of the black quilt, and its inner lining features a soft, furry fabric that’s guaranteed to provide your pooch with a right amount of comfort. The only colorful part of the hamper is the thin orange strip that goes around three of its four sides and contributes to the basket’s visibility in the night. Measuring 19″ x 16″ x 10″ in dimensions and weighing 6.6 pounds, this model can fit pups up to 24 pounds in weight. Unlike the previous two models we’ve reviewed, this one can be mounted only on the rear of your bicycle. It’s one of the largest products of this type we’ve seen so far, which brings a pretty convenient perk – it can be used as a dog bed. The thing that keeps the dog safe is the three-point restraint system that goes over the pup’s body and provides him with security during the bike rides. During the testing, we noticed that the straps are tight enough to prevent the dog from jumping out of the basket, but still loose enough to allow him to sit, stand up, and turn around. One thing we particularly liked is the cover, which is detachable and machine-washable. This will come in very handy to the owners of messier pups – you can just take the cover down and pop it into your washing machine. Our only complaint is the user manual which lacks more detailed instructions. Designed to keep the pooch safe and cozy, the Snoozer Pet Rider Basket works just as advertised. The basket is comfortable, and its restraint system is guaranteed to keep the dog secure and in place – what more could one want? The next model comes from a lesser-known producer of pet supplies, called the Walky Dog. Their basket can be mounted on the front of the bicycle and comes with a comfortable interior and some pockets for storage. Is it worth the money? Read on and find out! Like we said, this model can be placed on the front of the bike by using the dedicated hardware. It’s the so-called handlebar attachment that makes installing and de-attaching this model an easy task, even if you’ve never used one before. Once installed, the model is very stable and provides the dog owner with a peace of mind. The carrier itself sports a pretty good build quality. It has been manufactured from the two-tone PVC fabric that’s durable and easily protects the pooch from wind and rain. Its bottom is well padded and ensures comfort, and the top part features a breathable mesh structure and can be easily re-attached. Our four-legged tester, called Buster, was quite pleased with the softness of the basket’s interior and decided to stay there even after the ride was over. As mentioned in the intro, the Walky comes with an abundance of storage pockets. This feature will be invaluable to all pet owners who always take things like treats and bottles with them on a ride. There are also the reflective bands that make the hamper visible on the dark roads. Our only complaint is the fact that some people will have to buy handlebar adapters to correctly install this model on their bikes. On some bicycles, the wires and the brake cables will get into the way of the basket, forcing the owners to spend extra money on the special adapters. We advise you to check out if the handlebar of your bike is compatible with this carrier before purchasing it. The Walky Dog’s first attempt to create a quality dog bike attachment is a successful one. Even though it’s not flawless, it comes with plenty of useful features that make it worth considering for purchase. When it comes to these types of products, Snoozer is probably the most trusted brand – their pet basket for bikes are well-known for quality, safety, and reliability. This basket is one of the company’s most popular models, receiving praises from both the pet owners and other reviewers. It’s time for us take a closer look at it. Weighing just four pounds and having the dimensions of 10″ x 13″ x 10″, they can be used for the pups that weigh under 14 pounds. A word of advice, though – make sure that your four-legged companion is a few pounds below this limit, just to be sure. Just like all other baskets manufactured by Snoozer, this one also sports an attractive design and can be purchased in several color combinations. A heavy-duty micro-fiber is the primary material here, and it’s guaranteed to keep the pup safe from wind and cold during travel. There’s also the detachable cover that protects the pooch from rain, as well as some side pockets that allow easy storage of the necessities. Keeping this carrier clean is rather easy, which is always a big plus in our book. The model has an adequate support at its bottom part, which will keep it from interfering with your brake lines and the tire. It also comes with some extra handle straps that allow you to carry it around with your hand. The inner padding, on the other hand, is as comfortable as we expected it to be – in this field, Snoozer is simply unmatched. The only thing we didn’t like here is the size of the basket. It’s not the biggest model we’ve seen so far, but it’s still a little too bulky and might not be the best choice if you’re looking for a compact carrier. Take note of the dimensions and check out if they fit with your bicycle. Snoozer does it once again – they have created yet another model that certainly deserves its immense popularity. Its qualities are just stellar, and we can do nothing else but give it our sincere recommendation. Petsfit is a company well-known for their canine products, especially for their pet baskets that combine quality with the affordable price. Their Petsfit Dog Bicycle Carrier is yet another such product – it’s a beautifully done basket that provides your furry companion with lots of comforts and comes at a reasonable price. With the dimensions of 15.8″ x 12.8″ x 9.1″ and the weight of 3.6 pounds, this model is compact and lightweight enough to be a tempting offer to the owners of smaller bicycles. Even though it comes at an affordable price, it sports new attractive designs we’ve seen so far. It effortlessly mixes the green and gray colors into a combination that’s guaranteed to catch the attention of your friends. The “Oxford” material used here feels very pleasant to touch and, in our opinion, looks quite durable and long-lasting. There are several mesh pockets for the convenient storage of things like keys, bottles, and treats, as well as the mesh cover on the top of the hamper. It allows the owner to zip in the pet in the case of bad weather. Another great thing is the ability to convert this model from a basket to a carrier – you can simply carry your pet in it once you get off the bike. The whole thing is reinforced with a durable steel frame and stays in a stable position during the rides. The inner pad is very comfortable, just like we expected, but we were surprised by the fact that it’s also removable and machine-washable, which is pretty impressive for a basket for a bike in this price category. Of course, there’s also the inner leash clip with which you can restrain your pooch and prevent him from jumping out of the hamper in the middle of a ride. For us, this model has been the biggest surprise of the year so far. We didn’t expect for such an affordable dog bicycle seat be filled with so many useful features. It’s simply the best budget-friendly option out there! We’re always glad to have Snoozer’s canine products on a review – and for a good reason. Their bike carriers are highly popular among the pet parents all over the world, as they offer the best build quality and a ton of convenient features. Can that be said for this model? The Pet Rider Sporty features a design that’s quite similar to that of the other pet baskets made by Snoozer. It can be purchased in several different color combinations, with the cheapest one coming with a simple combination of black and grey. Even though it looks big in the pictures, the basket is quite compact, and most people won’t have issues with attaching it to their bikes. However, we should still note that the buckles are 1″ thick and are spaced 10″ apart, so you should make sure that your bike accommodates these measurements before you decide to make a purchase. The basket is attached to the frontal part of the bicycle by buckling it onto your handlebars while at the same time making sure that the brake cables don’t get in the way. Once it’s installed correctly, the Pet Rider Sporty feels absolutely stable and doesn’t move around while you’re pedaling. Just like we expected, the inner pad of this hamper is very soft and cozy, providing your furry companion with the comfort that he deserves. It is also removable and machine-washable, so you won’t have to worry about the mess that every pet occasionally makes. There’s also the cover that protects the pooch from rain and snow, as well as the pockets for the convenient storage of the necessities. The inner leash clip is of the highest quality and looks very sturdy and durable. It’s no wonder that this model is so popular among the dog owners. Once it’s installed correctly, it can provide your pooch with stable, safe, and cozy rides that he’s bound to enjoy. Purchasing it can’t really turn out as a mistake. Why You Need Dog Basket for Bike? Having a quality bike basket will allow you to take your furry little buddy with you wherever you go – isn’t that just cool? If you, for example, simply want to have a bike ride around the nearby park, your pooch will certainly appreciate it if you take him with you. The fact that your pooch is injured doesn’t mean that he needs to stay at home and skip his daily walk. You can simply place him in the basket, get on the bike, and give him a dose of fresh air that he certainly needs. Owners of older pet will find the bicycle basket invaluable. It will allow them to take their old four-legged companions out with them without the need to put a strain on their not-so-agile legs. Taking a pet for a walk in the middle of the summer brings a risk of hurting the dog’s paws. That won’t be an issue with a quality bike pet basket. 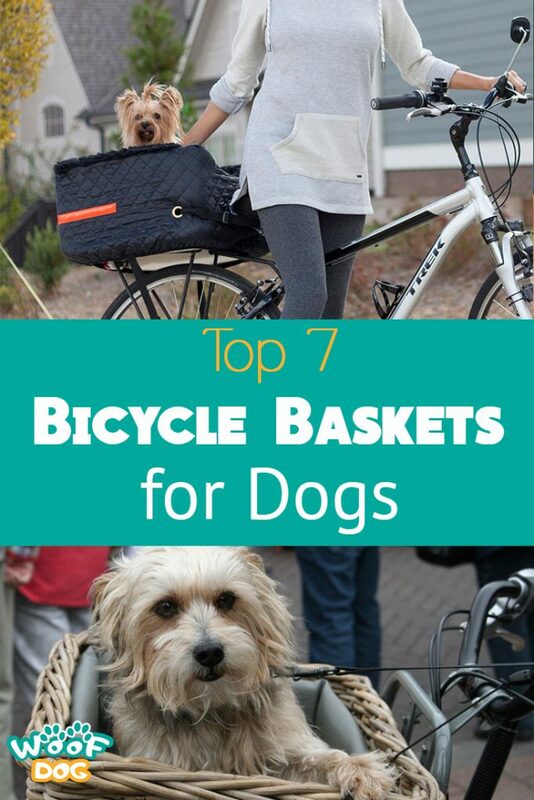 Which Type of Dog Basket for Bicycle is the Best? 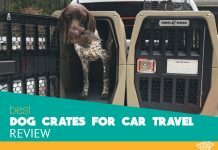 Those that are considering buying their very first dog bike carrier should know that there are a few different types of these products. They all come with distinct sets of features that might be of crucial importance in your particular case. Some models are designed to be attached to the bicycle’s handlebars, and some to be placed on its back rack. Some models can do both. To find out which of these two types is the best for you, take your pup’s size and temperament into consideration. It’s a lot easier to keep an eye out for the pooch if he’s in front of you and he has the best view from that position. Those who like to spend whole days biking with their pets know how important can the storage compartments be. They will allow you to carry all sorts of dog-related necessities, such as the treats, a leash, some water, and small toys. The dog owners who want the most out of their baskets should look for the multi-functional models. They can also be used as the dog beds and portable carriers, which can come in quite handy in certain situations. Make sure that such a model is easy to assemble and take apart. To prevent the pup from jumping out in the middle of the traffic, make sure to purchase a hamper that features an internal harness attachment. Other models use mesh-material tops or domes for the same purpose. One of the last things you’d want to happen is to have the basket fall down from the bike in the middle of the road. Learn how the attachments of your model work and secure the hamper the best that you can. Some breeds really like to chase and bark at everything that’s going around them. That’s why you should always use the basket’s leash attachment to keep your pooch secure and in place. As you already know, out four-legged friends can quickly get really excited and act unpredictably. Make sure that your pooch can’t get his tail, feet, or the fur into the moving parts of your bicycle. Quality models usually come with the convenient storage compartments that one can use to store snacks and water. Even though your dog won’t be running on the pavement, he’ll still get thirsty along the way – and that’s when these storage pockets show their useful purpose. Most pet baskets come with covers or hoods that will help you protect your dog from rain or snow. The cover can also calm him down in case he gets too excited. Riding together with your canine buddy is excellent fun. 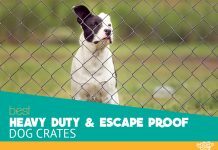 However, if you’re worried about his well-being and safety, take a look at the following tips that will help you with training your pooch to act appropriately when he’s in the dog basket. Choose a model where your dog will feel safe and comfortable. Try to find a hamper where he’ll be able to sit, stand, and turn around without any problems. If the padding of the chosen carrier isn’t sufficiently soft, you can simply add some pillows or blankets for the additional comfort. Always use the dedicated restraint system (which is usually the inner leash attachment) and tie your pooch to it. In that way, he won’t be able to jump out of the carrier in the middle of the ride. Before you take him on his first real journey, walk the bicycle with the pup in the basket. In that way, he’ll get familiar with it and get it to know while it’s moving slowly. Find a rough spot on the road on repeatedly go over it with the pup in the carrier. He’ll learn to anticipate the bumps and will feel more relaxed about them. Always try to predict all those things that could be scary or exciting to your pet – such as the loud traffic and the encounters with cats and other dogs. Finally, always reward the dog with his favorite treats if he acts like you would want him to. As you can see, the bike dog baskets are actually incredibly convenient and can allow the pet owner to take his four-legged companion with him on the long bike rides. When it’s installed correctly and has all the necessary features, a dog carrier acts as one of the safest options for bringing a pet on a bicycle ride. Even though many think that the special dog bike trailers a lot safer, not everybody can afford these things. The baskets are more affordable and just as secure, and present an excellent choice for those on a tight budget. In our reviews, we have tried to cover the most popular models on today’s market, going over their features, benefits, as well as flaws. We found that each model has at least one thing that separates it from the competition, whether that’s a durable frame, a quality fabric, the ease of installation, or just some extra accessories like the storage compartments. In our opinion, the best bike dog basket that money can buy today is the Tagalong Wicker – you will love it. It offers the right combination of comfort and safety for the price. We also have to give some special praise to the Walky Basket, which impressed us with its useful features, and to the Petit’s affordable model that offers a lot for a very reasonable price. We hope we’ve been helpful. No matter which of these dog carriers you choose, we wish pleasant journeys to both you and your furry friend!